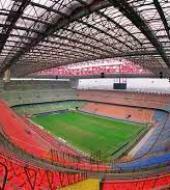 Discover the legendary stadium Giuseppe Meazza in San Siro and realize the dream of crossing the same areas trampled by the greatest champions in the history of Football. This combi-deal combines a ticket for the Hop on Hop off Bus 48 hours and the entrance to the San Siro Stadium (skip the line). The Hop on Hop off Bus stops at the San Siro stadium and therefore it is ideal to combine the highlights of the city and a visit to the stadium. How does it work? You will get both tickets by email! Supported by our specialized staff, you can retrace the real route of the football players, passing from the mixed zone to the locker rooms of both teams; subsequently you’ll pass through the famous tunnel entrance to the field, at the end of which you’ll get the most exciting and magical view of the “Scala del Calcio”. Once you leave the pitch you can take a rest in the stands, including that of honour and enjoying an additional view of the stadium, accompanied by an interesting historical and structural description. Hours: every day from 9:30 a.m. to 6:00 p.m. Location: Piazzale Angelo Moratti snc, 20151 Milan (Gate 8). Two routes - one ticket! City Sightseeing Milan, with its panoramic open-top double decker red buses, offers you the opportunity to discover this busy and attractive city from a height. With two lines and 12 stops, running 7 days a week all year round, City Sightseeing Milan is the best way to discover the city for those who have only a few hours to a few days.